Septic disposal systems are the single biggest source of anthropogenic (derived from humans) phosphorus in our lakes. Although it may take 10 or even 40 years, the soil in the disposal field will eventually become saturated with nutrients such as phosphorous, which migrate into the lake via the water table. Other potential sources of phosphorous are lawn fertilizers (including compost), soaps and detergents. Placing the septic tank and disposal field 100 feet or more back from the lake coupled with regular maintenance will reduce their long term impact on water quality. 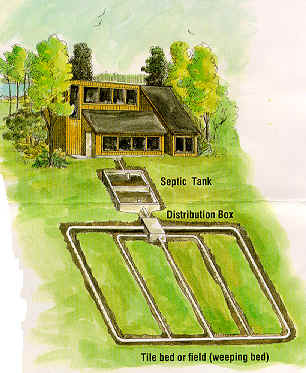 Remember: A faulty septic system is a serious threat, both to water quality and to your family's health. Inspect and pump your system every 2-3 years and don't flush toxic substances such as septic tank cleaners down the sink drain and toilet. These types of additives kill the bacteria needed for the septic system to work properly!